Attentions pinups, retro, and vintage lovers. ModCloth is having a GREAT cyber Monday sale!!!! 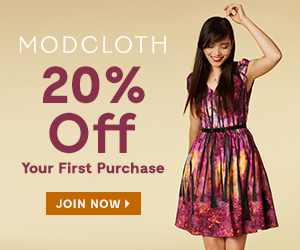 The ModCloth As You Wish Sale featuring some of their most popular items starts today! The ModCloth As You Wish Sale is a unique sale of the “Most Wished For” items and includes 100s of fan-selected styles at 25% off for a limited time! The styles were voted on by ModCloth’s customers through the Be the Buyer Program, Tweets, Pins, Likes, Votes, & Wishes! Don’t miss out on this great opportunity to save on these beloved pieces.